Ideal for office use and incredible value for money, the HP OfficeJet 8715 is a sleek black all-in-one printer offering print, copy, scan and fax functions. With a flatbed scanner, wireless capabilities and wired connectivity via a USB point, the printer is flexible and easy to use, with some impressive features. 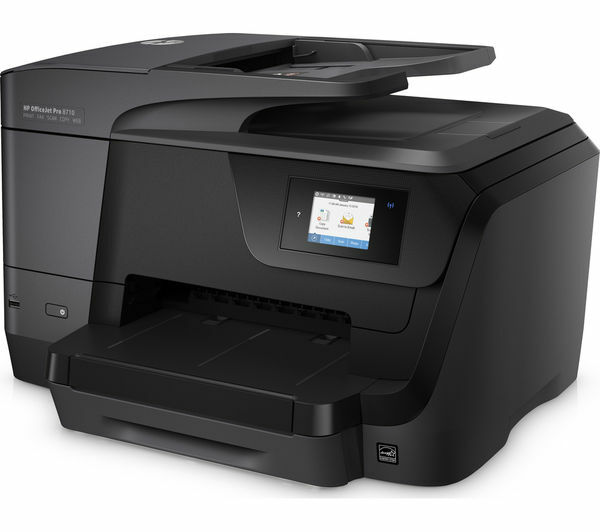 Measuring 49.95 x 40.48 x 33.91 cm with a weight of 11.54kg, the HP OfficeJet 8715 boasts a 6.73cm touchscreen display, an automatic paper sensor and a duty cycle of up to 25,000 impressions per month. Operating HP Thermal Inkjet technology and using four cartridges, the printer can be used alongside a PC or laptop, or any number of mobile devices via HP ePrint connectivity, Apple AirPrint, Mopria certified and wireless networks. The printer has a 250-sheet input tray and a 150-output tray, which are ideal for larger scale jobs. As well as incredible image quality and print management functions, the HP OfficeJet 8715 boasts a variety of other features and benefits, including automatic duplex printing, scan to email and colour faxing at a rate of 4 seconds per page for up to 100 pages. In terms of speed, the printer can create up to 22 ppm in monochrome or 18 ppm in colour, replicate 30 cpm in monochrome or 27 cpm in colour and scan 8 ipm in both black and white and colour. The HP OfficeJet 8715 has a maximum resolution of 4800x1200 dpi in colour or 1200x1200 dpi for monochrome, as well as a scanner resolution of 1200 dpi and a copier resolution of 600 dpi. The scanner function supports a variety of image types and there is an automatic feeder capable of holding 50 sheets of paper. Large and heavy, this particular printer may look out of place in a home office environment. While it boasts a variety of fantastic features, some users have reported start-up issues with its wireless functions, an unreliable touchscreen display and paper feed issues.